"I can´t believe! It´s amazing to discover that you can reach so much more than you think!" "I am amazed at my own talent! You can learn so much in three hours!" 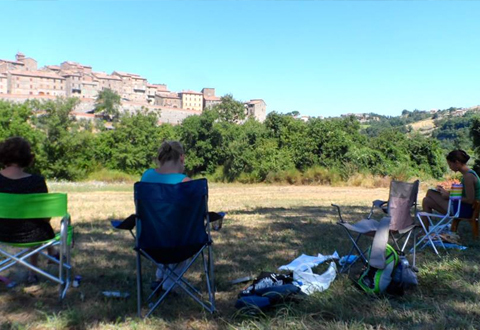 How to capture the most amazing Tuscan views... Better and much more personal than an Iphone-pic! 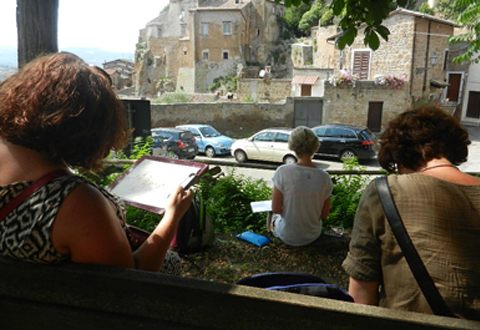 3 Hour course in Cortona, Panicale, Castiglione del Lago or in the countyside under the guidance of a professional artist/instructor. 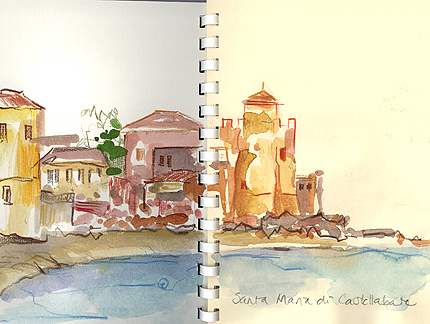 Go back home with a sketchbook full of personal impressions. 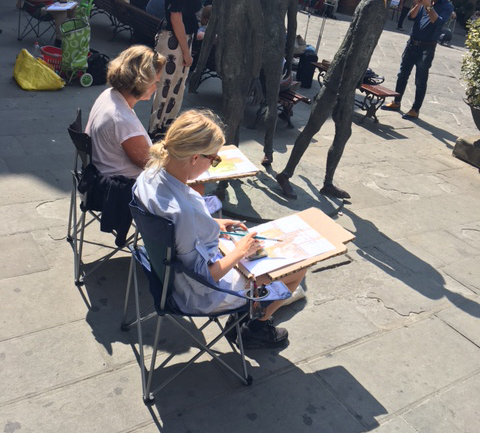 Because everybody can draw! Difficult? No, not with my way of working! Feel the space, express yourself, see the light and tell the story! You will learn the most easy principles of the perspective, reducing what you see into simple compositions, using less colours to reach the optimal result. 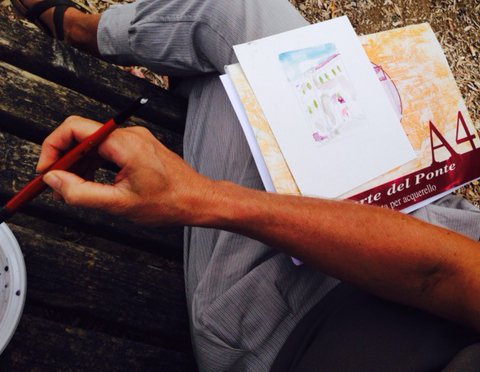 Believe me: drawing is much more easier than you think! 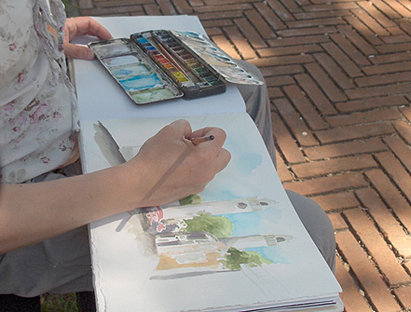 We work with quick ink pen, waterbrush, watercolour and color pencils. 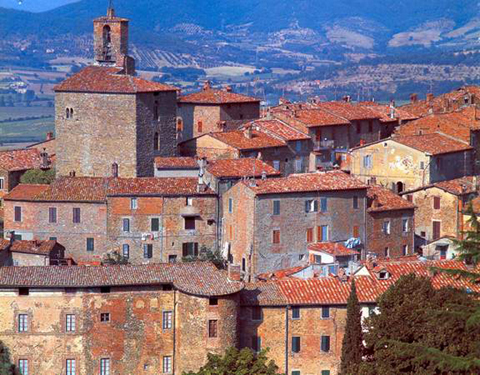 The border area Tuscany/Umbria has a lot of panoramic jewels, far from the crowded tourist places. These are the real places to experience the beauty and to use the decors for artistic impressions. 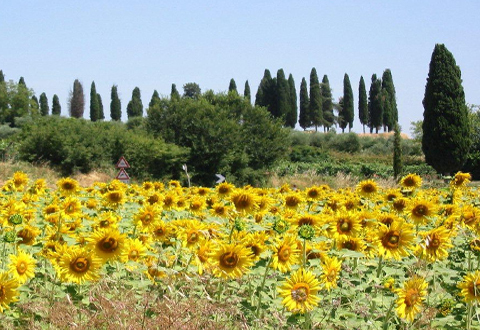 The landscape is famous for its rolling fields, sunflowers and slender cypresses. We'll find the nicest places for the most beautifull impressions. We start from steps Piazza della Republica. During the course, we will walk to several beautiful places in the historic center: the narrow streets with perspective, the view from the ramparts. 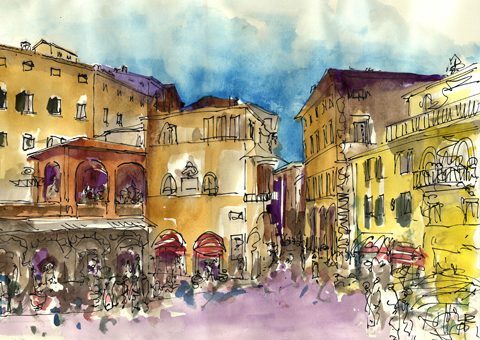 We start in the old town from the Piazza Via Vittorio Emanuele/fountain. 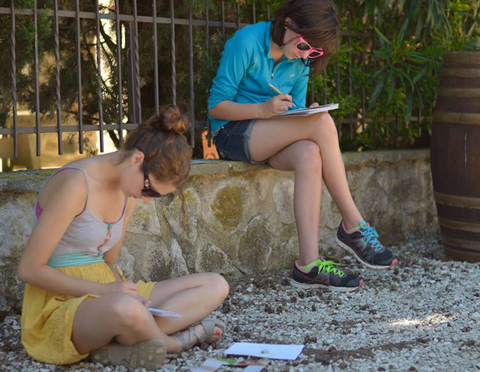 During the course, we will walk to several beautiful places in the historic center: the narrow streets with perspective and the view on Lake Trasimeno. 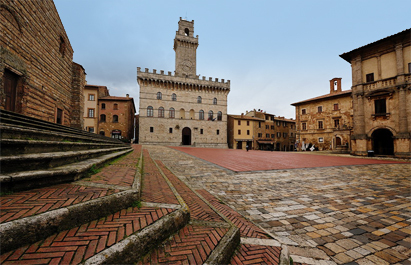 We start in the cosy centre by Fontana Maggiore, the big fountain on the Piazza. 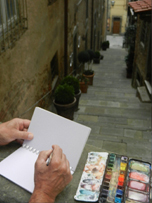 During the course, we will walk to several beautiful intime narrow streets and places in the historic center. 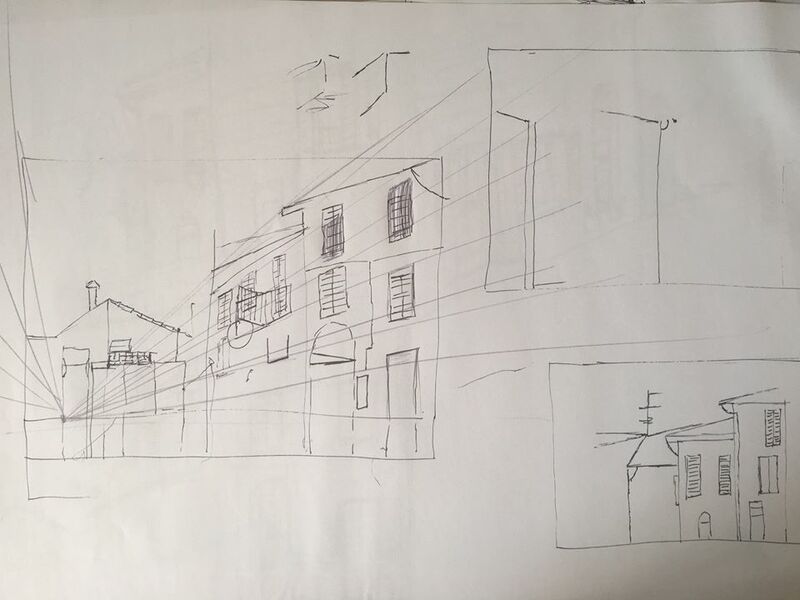 We start from the studio Tipografia Sperimentale, and walk into the countryside and the little village of Casamaggiore, with the monument, old church and perspective views. The Dutch artist Agnes den Hartogh takes the visitors to a journey worldwide to share her impressions. All over the world she has done a large number of projects (Rabobank Foundation, Rotary, Cadena Foundation, and also for many companies) and she has travelled to different places in Europe, Asia, Africa and Latin America. Every place gives her inspiration. Her favourite themes are architecture and the way people live. 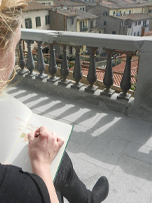 The quick drawings in her sketchbooks are the start of big paintings, collages and monotypes. 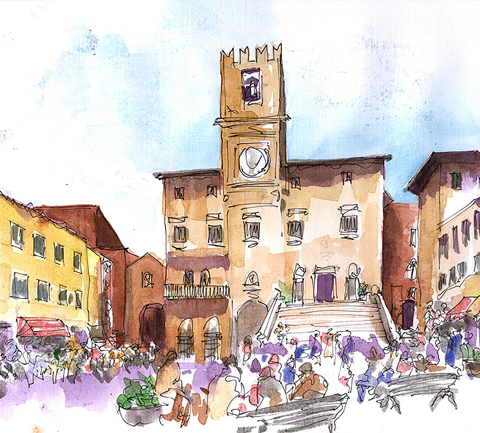 Especially the last years she has fallen in love with the Tuscan and Umbrian area and has created a lot of artwork inspired by historical places in Italy. 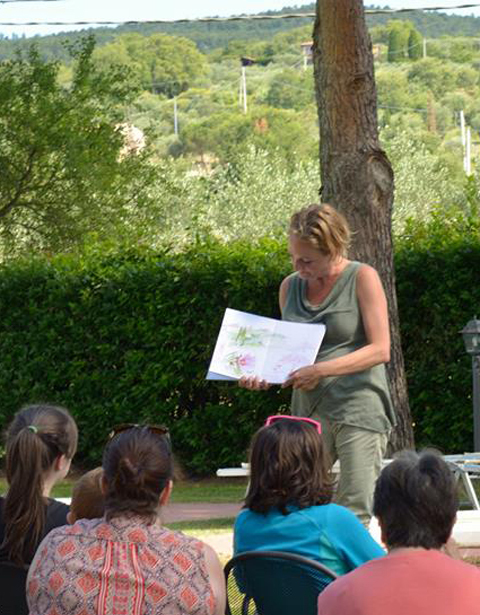 In July 2011 she started in Casamaggiore-Castiglione del Lago (Umbria, Italy) her studio Tipografia Sperimentale. After her study on the Academy of Arts in Kampen the Netherlands – where she graduated in Graphic Design, specialized Illustration Design - she worked for 11 years as a professor on the Art Highschool Graphic Design in Amsterdam and one year at the Multimedia Academy in Leeuwarden. She combined her teaching with working in her own graphic design enterprise, where she did many different design projects for o.a. KLM, Tommy Hilfiger, Ministry of Finance, Rabobank Foundation. In the meantime she worked also as an autonome artist and she developed her techniques (collage and experimental printing) and tried to find a balance between these complicated techniques and her very quick way of drawing and illustrating impressions. Agnes has done many exhibitions and projects all over the world (Honduras, Kenia, Albania, Poland, Cambodia, Mexico and Laos) and now she combines her work as professional illustrator in Holland with her works and workshops in her studio in Casamaggiore. In the studio Tipografia Sperimentale she expanded her techniques, inspired by all the ingredients the Umbrian and Tuscan cities and landscapes can give her. As a member of Rotary International she is involved in national and international projects. 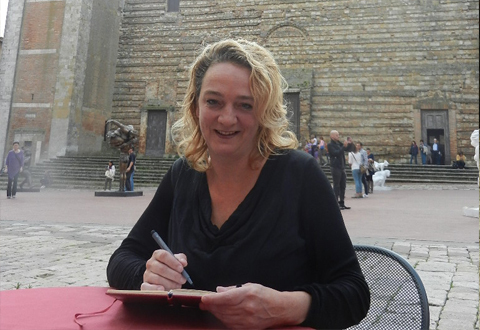 Agnes also works for Dutch magazines by publishing articles and is a member of the world wide organisation Urban Sketchers. Please complete the brief form below and I will be in touch as soon as possible. - many easy tips & tricks!